I was recently asked how the American economy was going. I can say, that as of Labor Day weekend, science fiction/media/anime/art/gaming/fantasy fans have few qualms about spending lots of cash and credit on what they love. After going through the two vast floors of vendors room at Dragon Con, I would also say business and business competition is thriving for the fannish demographic. And they want to shop. Tee shirts, buttons, posters, toys, books, and more, more, more. Dragon Con is a very popular science-fiction and fantasy convention held over the Labor Day weekend in Atlanta Georgia. It runs for 4 days, is spread over five hotels, and unofficially overflows into many others. How many come? One media outlet said 60,000, another 65,000 visitors. Friday night at Dragon Con. Con-goers enjoy the costume parade with fans dressed as characters from a cornucopia of media shows and movies such as “Arrow,” “The Walking Dead” (zombies anyone?) and the 501st Legion a “Star Wars” fan group, listen to panels with actors, authors or fans, meet and make friends, party hearty, and enjoy their time away from the real world. Which brings us to the subject of this blog: the dealer’s room, or rather the Vendors room at Dragon Con. The two-floor vendors room was probably the largest array of non-specific-to-a-fandom dealers I’ve ever seen in the decades I’ve gone to SF/Media/book conventions. Dragon Con sells to the fashionable Steampunk fans, comic book fans, media television (the CW’s “Arrow” was very hot), elaborate jewelry, stage and day make-up, movie/TV posters, and much more. It was one stop-shopping for even a casual fan to spend lots of their hard-earned, hard-saved money. The long-broadcast British television show, “Doctor Who” was represented by “The Who Shop” (get your Dalek salt and pepper shakers here) as well as other vendors. The two times I visited the Atlanta Media Mart, it was absolutely packed with customers after that special gift, the one-of-a-kind toy, the dress that would make them fit in at the Renaissance Fair or the tee-shirt that lets you feel – for a moment – that you are Iron Man. What struck me was the number of clothing vendors, their diversity, their offerings and their clientele. Costuming for adults always increases in fall (Halloween?) but now with Renaissance Fairs and other outdoor parties, many fans keep multiple costumes in their closets. There is nothing inexpensive about any of this. And, increasingly, fans are willing to pay a lot. For example: If you wanted a simple corset, or a poet’s shirt, an expensive dress for a Victorian Steampunk outfit or just a necklace, you can find it at a reasonable price. If you’d prefer something more expensive, they will be happy to supply that. 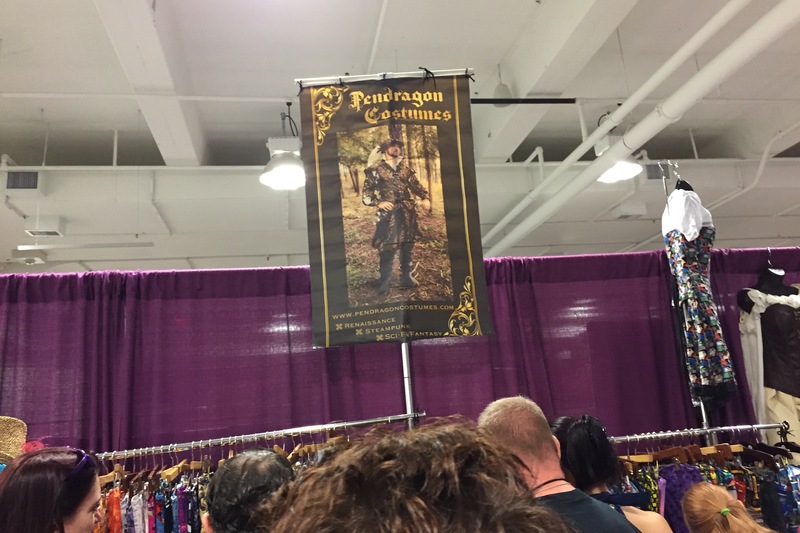 Pendragon Costumes out of California had a large display. I had never heard of them before I was literally stopped in my tracks by the beauty of a leather Captain American jacket. The corset dress on the right is $230 on their website. A consumer could try on and buy a dress, corset, cape there or make it a special order. But what was noticeable is that they had several corset-and-leather selling competitors of equal quality in the building. 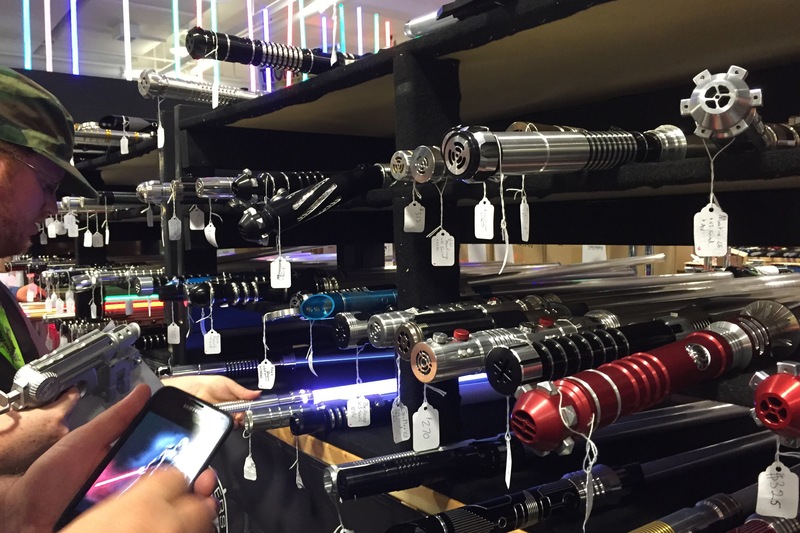 The other stand-out vendor was Ultra Sabers, the combat lightsaber specialists. 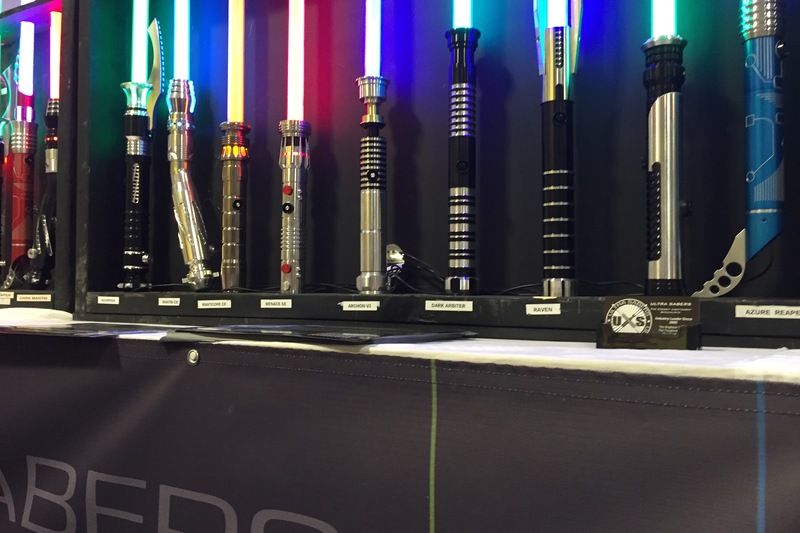 Their booth was lined with their product – “Star Wars” sabers – and doing bustling business. While Disney allows you (or your kids) to “make your own lightsaber,” these are lightsabers for the adult fan who knows he wants one. Three-fourths of the customers were men when I passed. I’m sure women want them (heck, yeah!) but they weren’t the majority of patrons. While “Star Wars” Celebration in April 2015, took over the Anaheim convention center, its goals were clear-cut as to whom it was selling to, what was sold (material related to the Saga) and their future audience. I suspect that if the “Star Wars” #ForceFriday toy release had been a week earlier, it would have had a huge presence at Dragon Con. The Internet has provided vast opportunities for sellers and buyers. If you didn’t make a choice at the convention, then you can order them over the Web. This entry was posted in Uncategorized and tagged Captain America, commerce, conventions, costumes, Dalek salt and pepper shakers, Dragon Con, fandom, Star Wars, Steampunk. Bookmark the permalink.